1 out of 6 fatalities in Georgia occurred in a crash involving a large truck. Of the 270 fatalities that involved large trucks since 2006, 86.3 per cent of the people killed were occupants in the smaller vehicle compared with 13.7 percent for the large truck occupants. This is because large trucks are clearly heavier and cannot stop as quickly or maneuver as well to avoid a crash. A higher proportion of pickup trucks were fatal (nearly twice as many) compared to that of passenger cars. The number of crashes involving large trucks increased 12.22 percent from 2000 to 2006. The greatest increase occurred in the category of tractors with twin trailers, reaching 26.27 percent from 2000 to 2006. Fatal crashes involving large trucks increased 12.26 percent from 2000 to 2006 while fatal crashes that involved both truck tractors and tractors with twin trailers increased more than 28 percent. Nearly half of the fatal crashes involving large trucks in Georgia occurred in rural counties, including those along the high traffic I-75 and I-95 corridors on the east coast lead the rural county fatality rate for truck accidents. 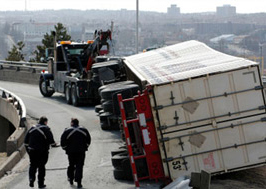 Loss of control due to speeding, shifting cargo, overloaded trucks, systems failure, and poor road conditions. Unsafe operation by the driver due to inexperience or impaired faculties. The largest factor is driver fatigue due to long hours and high-pressure delivery deadlines that push a driver to the point of sleep deprivation. This impacts their alertness and reaction times. Despite the devastating effects that truck accidents have on people’s lives, insurance adjustors are not always the most sympathetic and are often just concerned with closing the claim as soon as possible perhaps even before you have had time to recover or get through the process of dealing with the death of a loved one. Injuries must be given the time for proper diagnosis, and families need the time to get through making any necessary arrangements. Georgia has many specific laws in regards to recovering damages related to a truck accident, including the right to compensation for pain and suffering, medical expense and lost wages reimbursement, and even punitive damages if the case calls for it. When it comes to trucking accidents, it is important to get a full investigation to understand if it was driver negligence, mechanical failure, road conditions or a combination of factors that led to the truck accident. Having a strong legal team on your side can also lead to further investigation to see if the trucking company has failed to maintain safety standards or has had a history of truck accidents. Jonap and Associates have a long history of helping customers with truck accidents, helping fight for their rights to receive the compensation and damages they deserve. While you focus on healing and getting back to your life, our team of qualified legal professionals will work on your behalf to handle the complicated legal issues that are involved in truck accidents.